After five months of negotiations, Council voted 5-0 to purchase the dealership to consolidate operations from two aging structures which no longer suit the needs of Richwood. Moving out of these two buildings will save as much as $12,000 a year in utility bills. One is a flood-prone modular home that currently houses administrative offices. Now that house can be sold. The other is the Village Hall, the landmark Opera House, which would require more than $675,000 to be made safe and usable. Now the repairs can be limited to patching the roof and repairing the clock. The village will spend $288,000 for the Mills Chevrolet building and land, plus another $50,000 for remodeling. The showroom will become a council chamber. Other parts of the building will house administrative offices and the police department. Part of the used-car lot will become an impound lot. The former service department will be used to repair, wash, and store village vehicles. When my father built the dealership in 1964-65, he had no idea he was constructing a future city hall. I never knew all the details of this story. Lets say that it took place in a small Kentucky diner on a hot day in the early 1940s, before air conditioning became widespread. My newly married parents were looking over the menu. Someone inquired about the soup of the day. 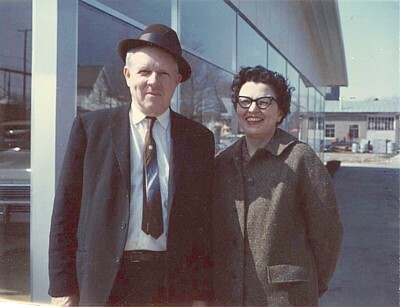 Heres a picture of my parents from about 1971, standing in front of my fathers Chevrolet dealership. I havent posted it here before now, because I didnt find it in my archives. Rather, it turned up in Cousin Lindas archives. Linda is my first cousin once removed, the granddaughter of my mother's brother Ralph Buckingham. A portion of the Buckingham picture trove has come down to her, and shes shared the photos with me. Ive used some of them to put together a new article about her grandfather, my uncle. Ralph in a 1931 swimming suit! His bride in eggshell horsehair and lace mitts! See it all in Uncle Buck. Today is Juneteenth, the anniversary of the day in 1865 when, more than two months after the conclusion of the Civil War, slaves in Texas were finally told that they had been emancipated by a proclamation that President Lincoln had issued 2½ years earlier. The British Commonwealth does actually have at least one such place. Three decades before our Civil War, the British Empire set all its slaves free in 1838. 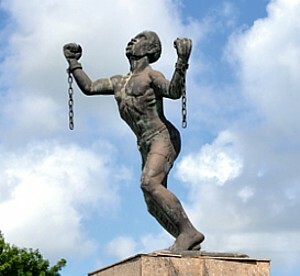 This 1985 statue now stands in the middle of Emancipation Roundabout on the island of Barbados. Above is another of the pictures I took last month on my visit to Oberlin, Ohio. 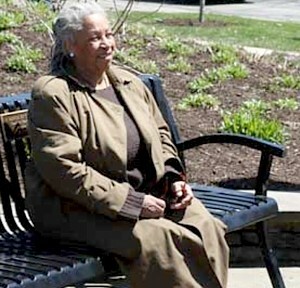 On the left is a College photo from April 23 of this year, when the author came to Oberlin to dedicate her bench. 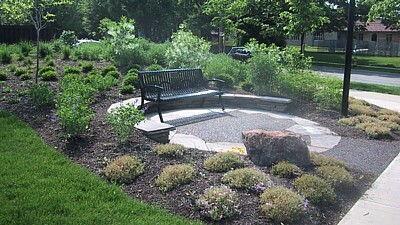 A Bench by the Road was placed by the Toni Morrison Society in the parklet that commemorates Oberlins involvement in the Underground Railroad. Its the second of a projected 20 such memorials around the nation, to remind us that there was a time when not all of America was the land of the free. 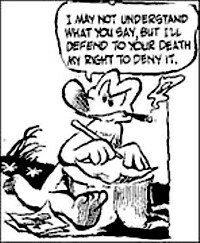 That paraskavedekatriaphobic joke comes from Walt Kellys Pogo comic strip. Another random detail: there was an adorable character in Pogo's swamp, perhaps a young raccoon or something, whose name was Lil Awry. But I always wanted to pronounce it AW-ree, for no other reason than the awww-producing cuteness of Lil Awry. Somehow, I remember these things 40 years later. Forty-five years ago today, as I described in an earlier article, a Wednesday-afternoon fire destroyed my father's place of business in Richwood, Ohio. Later in that year of 1964, it was a rainy Christmas Day when I took the photo below. We're looking south on Franklin Street toward the main business district. 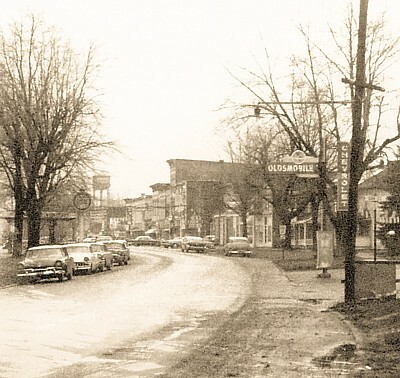 On the left, the Pure Oil service station and Richwood's old water tower are still visible. On the right, the pavement is muddy, because the new home of Vernon M. Thomas Chevrolet-Oldsmobile is under construction. My father continued to run the dealership until he retired in 1973. Then he sold the business to the Mills family, who kept it in operation for 35 more years. But now the building sits empty. Mills Chevrolet is one of nearly 2,000 General Motors dealerships that have recently gone out of business or will soon be going out of business as a result of GMs bankruptcy. More details, and a dozen more pictures from the early days of the garage, are in my new article Beginning and Ending. If I were a professional columnist, or a blogger with an expectation of producing something every day, I think Id want to be working ahead. Id have some columns written in advance so Id be ready for the inevitable deadline when there was absolutely nothing to write about. On this amateur website, I try not to let more than six days go by without an update. To make sure that I can satisfy that self-imposed rule, I do work ahead. You arent reading tweets that have just occurred to me! Since April Ive been holding one piece that can run at any time, and I have several other ideas in various stages of development, including one planned for tomorrow. Then there's the occasional topic that interests me at a random time of the year but will be most appropriate for a different season. Ive pre-written one piece that will run later this month, two for July, one for September, one for October, three for December, and one for March 2010. Stay tuned. Mondays Pittsburgh Post-Gazette featured an article by Dejan Kovacevic about a 2-1 baseball game the day before. The headline: Familiar story: Maholm is victim of non-support. Pittsburgh Pirates pitcher Paul Maholm gave up only one earned run but lost the game, as his teammates failed to score more than one run themselves. Is this true? Is offensive output either feast or famine, with relatively few games falling in the middle? 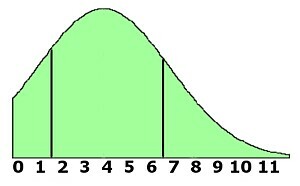 Statistically, runs per game ought to be distributed in a bell curve like this, which Ive divided into three zones. 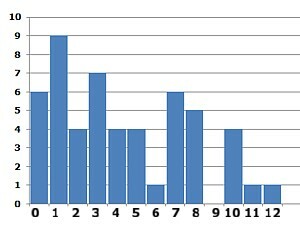 Most nights, a team should score between 2 and 6 runs, the central part of the graph. There will be a few famine nights when theyll be shut out or score only one run, as on the left, and there will be a few feast nights when they score seven or more, as on the right. I graphed the actual numbers so far this season for a typical team, the St. Louis Cardinals. Their graph resembles the bell curve. 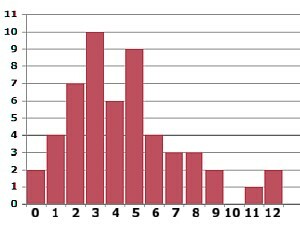 Then I made a similar histogram for the Pittsburgh Pirates. Their graph is not so bell-like. This becomes even clearer when we group the numbers as percentages in a chart. The Cardinals feast or famine nights total only 32% of their games, but for the Pirates that number is a whopping 62%. These statistics do support Kovacevics observation. MAY 30, 2009 WHAT RHYMES WITH ALABARMY? One sunny day one glorious May, Bill Doodle made a rash decision. Click his name for the backstory, which includes my lyrics from 1965. A little research reveals that Ally is a new name for a troubled institution, GMAC Bank. So how does this new bank expect us to pronounce its name? It might be the traditional AL-LIGH, as in The Soviet Union was our ally in World War II. But Ive grown to expect cutesier corporate pronunciations. Look at the purple lower-case logo. My first thought: it rhymes with Sally, like the TV character Ally McBeal. 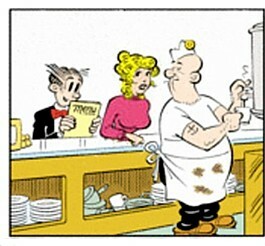 Hey, I just opened an account at that new Alley Bank! Or maybe, to suggest all, it rhymes with Wally. Or maybe, to suggest totally, it rhymes with Ali. Give us a hint, GM. After all, how did people ever learn that Chevrolet doesnt rhyme with violet? MAY 26, 2009 ARE YOU SURE THIS IS THE RIGHT WAY? 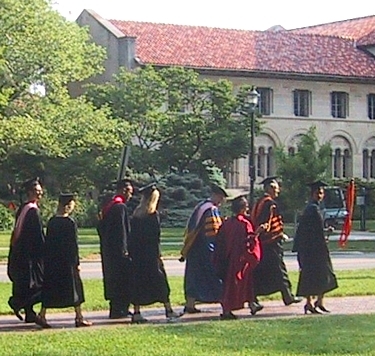 Yesterday, I saw the graduates of the Oberlin College Class of 2009 set off in a new direction. Their academic procession took a route that diverged from the traditional one, arriving at a new location on the north side of Tappan Square. I was there as an unofficial observer. It's been 40 years since my own graduation, but I already had my "40th reunion" a year ago. You can see my photos in the gallery I posted today, which is called 40th Anniversary Commencement. 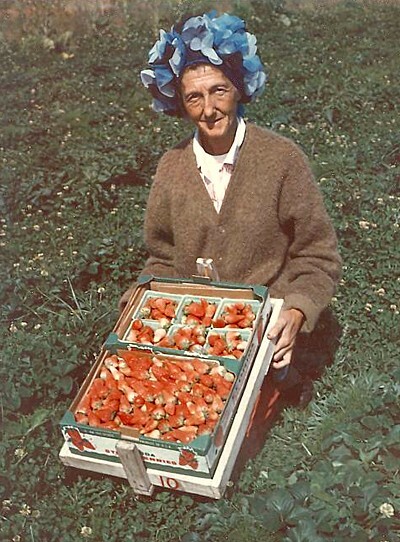 "Do you know who the lady with the strawberries is?" asked Cousin Linda last year. Linda is my first cousin once removed, the granddaughter of my mother's brother Ralph Buckingham. 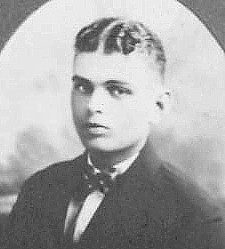 She was going through some old pictures, including one of Uncle Ralph as a high school senior in 1927. Among the pictures was the unlabeled photo at the right. "I am not sure it is even a relative, and if it is, what side of my family?" I'm afraid I can't recognize the strawberry lady either. She could be a Buckingham, or a Rauschenberger, or someone totally unrelated. Nice hat, though. Hed learned that while consumers can buy a hundred generic aspirin caplets for only $1.99, they will happily pay $6.79 for the exact same pills if theyre labeled Bayer. The boss asked his employees, gathered in the ballroom and watching on TV, to split up into small groups and come up with operational improvements to turn branding into profits. Unfortunately, the company was not one that sold low-priced name-brand products. It sold services. And Im sorry to report that the brainstorming employees failed their assignment. Their best idea had nothing to do with branding. It was, "New employees just sit around for their first two weeks unable to use their computers because they're still waiting for their passwords. We should speed up the password-assignment process." A valid point, but probably not the kind of thing the boss had in mind. MAY 12, 2009 GIRLS! WHAT'S THE MATTER WITH GIRLS TODAY? Good news, music lovers! In my archives from high school days, I've located the show-stopping quartet from my never-produced 1964 musical, Follow Your Star. I had previously posted an excerpt on this website, but now the complete manuscript is available! The song is called "They Don't Make Girls the Same." A group of young men express their objections to the newfangled concept of feminism. And folks ask, "Why is chivalry dead? Why do men not show respect to women? I wonder why." It's because the women aren't so tame! For damsels in distress have a charm that makes men want to help them all they can; but today's females have gained all the rights that the males have, so they don't need any man to help them. Girls today are not the same! "Why not throw men away?" To think that helpless little females get along without us long, without us. We don't like to think they can be strong without us long, without us. We are men, and strong, and they are wrong, and they are wrong without us! Girls today are not the same! 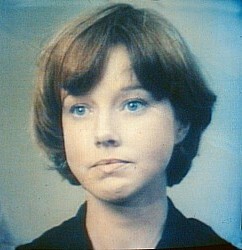 I photographed this face off my TV screen thirty years ago. I recall other faces, including one belonging to a local baton twirler. Where have all the lovely young ladies gone? Somewhat to my amazement, I found out simply by searching the Internet! A new article about my Seventies Flashbacks gives the details. I started this website in 2000 using the free Geocities service offered by Yahoo! As I recently noted in my "wayback machine" entry, within a couple of years the service was no longer free for me, because I began paying a small amount to add capabilities and subtract advertising. Recently Yahoo! announced that it will be phasing out Geocities over the summer. Because this site has become my major hobby, there was no question that I would keep it alive, but I had to find it a new home. Now I'll be paying a slightly larger amount, about $10 a month, for an actual domain of my own. The address t2buck.com refers, of course, to my "T-squared" nickname at work and to the version of my name that I'm using as the author of this website, T. Buckingham Thomas. (1) Links to photo galleries currently send you to a secondary site with addresses like geocities.com/t2k_us/pictures.htm. I need to copy those pages and images to this site and update the links. (2) There are over 100 audio files here with links that send you to addresses like geocities.com/tbtho/audio.mp3. I need to copy those sounds to this site and change each link. (3) I need to pass the word, via e-mail and other means, that it's now t2buck.com that folks should visit to learn more about me than anyone ought to know. Please update your bookmarks!